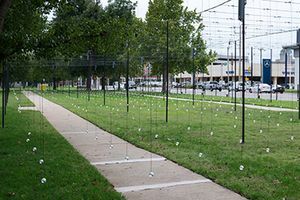 Through March 2019, Oklahoma Contemporary will partner with Madison Square Park Conservancy to bring Erwin Redl’s installation Whiteout to Campbell Art Park. Whiteout is comprised of hundreds of transparent white spheres, each embedded with a discrete, white LED light and suspended from a square grid of steel poles and cabling. The orbs are not fixed and can move with the wind currents from their positions of one foot above the ground plane. The white LEDs are animated in large-scale patterns, superimposing a virtual movement on top of the kinetic movement of the spheres. The sequence of light is an incandescent treatment of urban public space across the dark seasons of the late fall and winter. Get hands-on in our Learning Gallery! A bevy of Lite Brites will inspire conversations about and art made from light and patterns. Instructions will point visitors to the Whiteout installation at Campbell Art Park.